A huge thanks to Family Christian for sponsoring today's post! Our love of Veggie Tales is all our own! 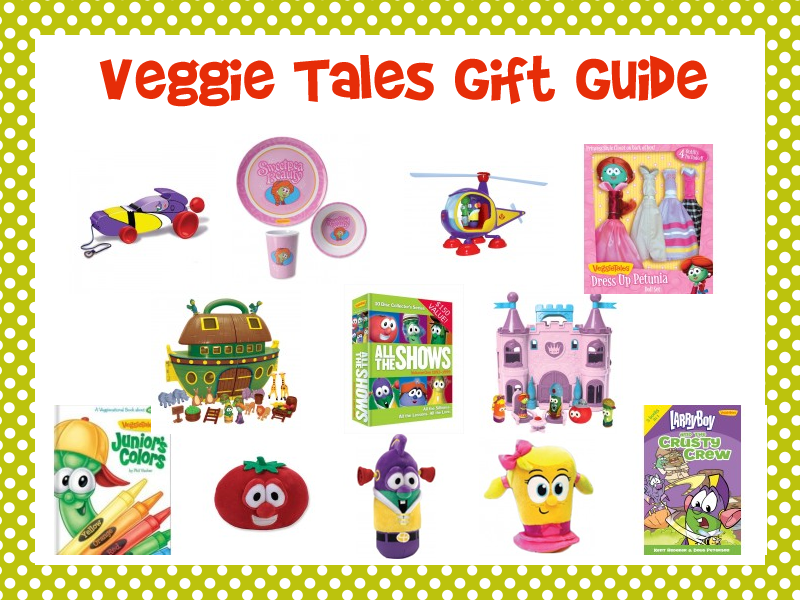 It's no secret that we absolutely, positively LOVE Veggie Tales around my house! So, when my son said he wanted to have a Veggie Tales theme for his and his sister's joint birthday party, I could not WAIT to get started! Now I will be the first to admit, I'm not the greatest party planner in the world. I cannot throw elaborate, magazine worthy events... I'm just not THAT talented! But I do enjoy planning a great party- coming up with fun ways to incorporate the theme of the year through food, games and decorations! I have found it doesn't have to be perfect to be a blast! 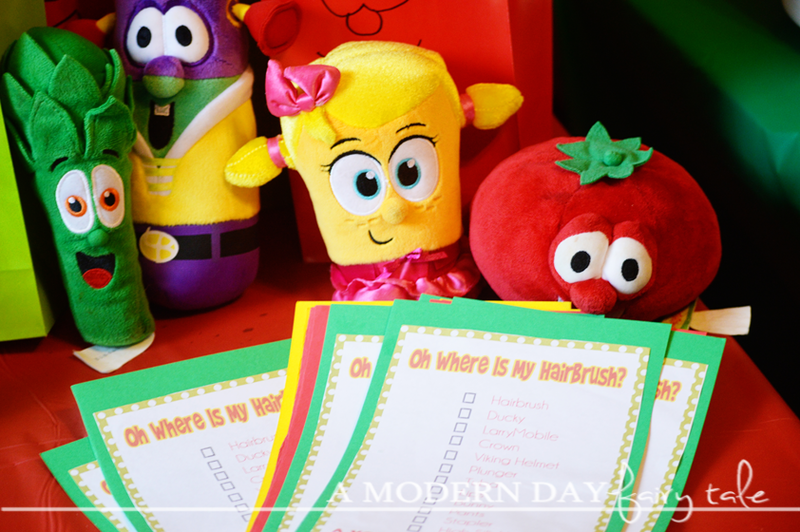 And this Veggie Tales party may have been my favorite to plan yet! If you're looking for ideas for your Veggie Tales event, you're in luck! 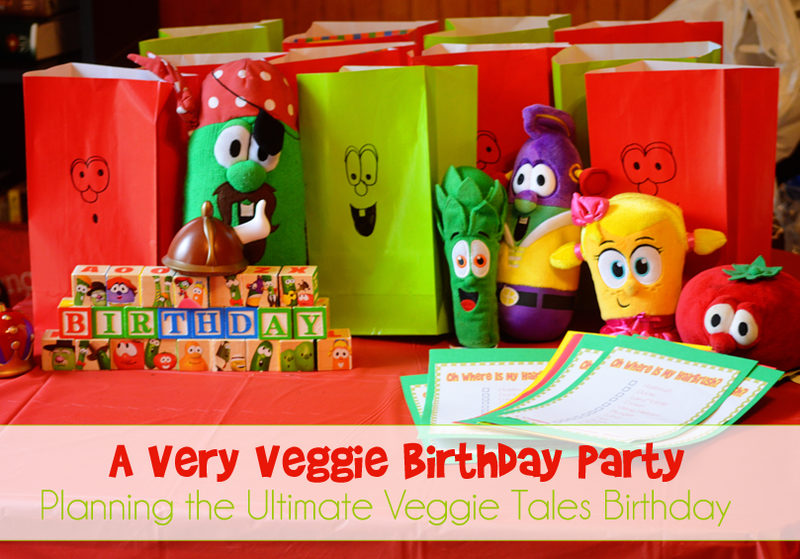 Today, I'm sharing what we did to have a super awesome Very Veggie Birthday Party!! Honestly, Veggie Tales is not a super common birthday theme, so chances of stumbling on decorations at your local party store are quite slim. So for our tablecloths, balloons, etc we stuck with a simple color scheme of red, green and yellow...these are pretty common colors seen on Veggie merchandise and the logo...and were easy to find just about anywhere! In fact, we found much of this simple decor at our local dollar store. Now, to bring in the Veggie fun took a little more creativity! I don't know about you, but I'm not a huge fan of spending a ton of money on party decor. They're usually used just once, so it's basically throwing money away. So, when possible I like to come up with creative decor ideas using products that we could use again and again. For this party, we brought in some Veggie Tales toys that my children already owned, and purchased a few more too. We spread our favorite plush throughout the goodie bag/game table. We placed some of our plastic/rubber figures from toys like the Princess Castle or the bath toys on the table near the food. We used the nesting number blocks on the gift table as a fun reminder of how old each child was (and in our case, a fun way to label which side of the table each child's gifts went on!) But perhaps my absolute favorite toy turned decor was the Veggie Tales ABC Block Set. 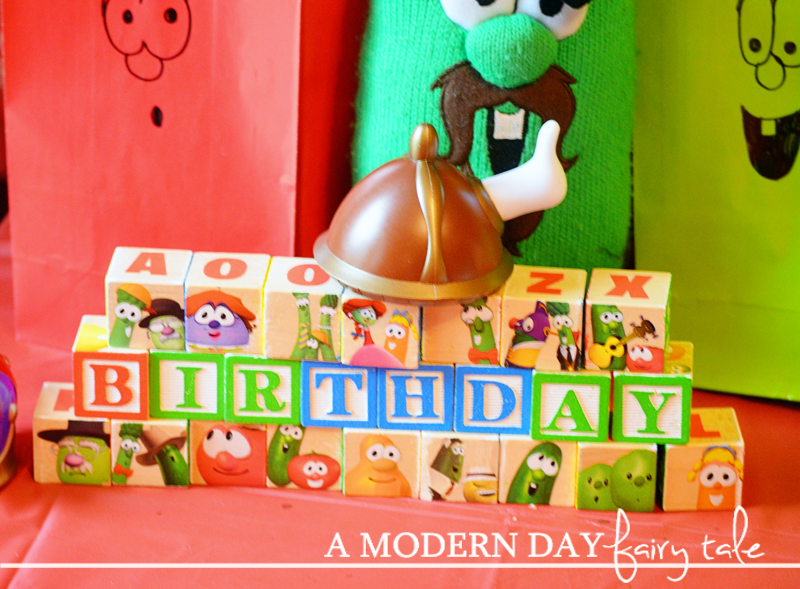 I used the blocks to spell out birthday and show off some more favorite Veggie characters, and then the fantastic pull toy that carried them served as the perfect holder for our forks and spoons...adding another touch of Veggie fun! 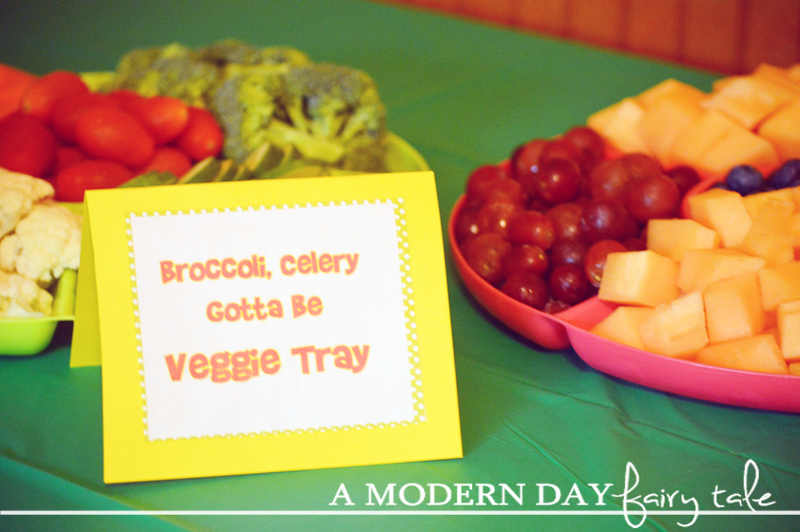 Typically, I'm not super creative when it comes to party food and sticking to a theme... but Veggie Tales makes it super easy! After all, it is a show about vegetables, right? For our entree, we stuck with hot dogs- simple and inexpensive! 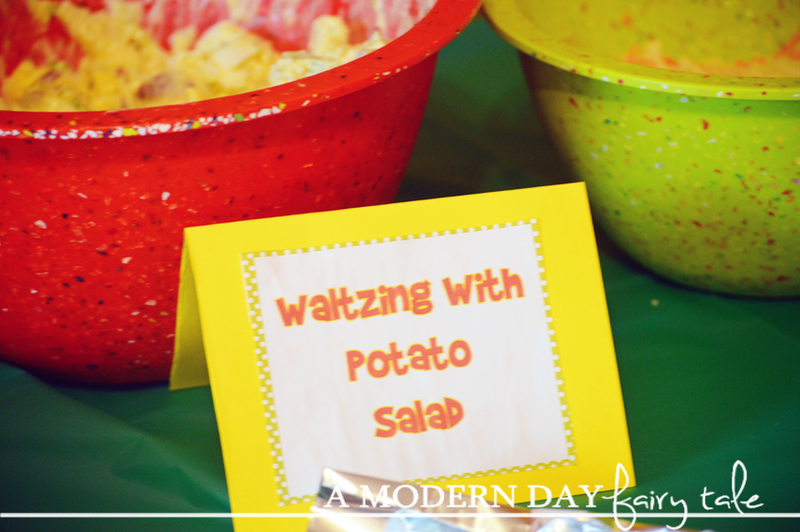 The sides were just as simple, but to bring in the Veggie fun, we gave many of our side dishes creative names like 'Waltzing With Potato Salad' and 'Broccoli, Celery, Gotta Be Veggie Tray'. We also brought in some snack foods as a nod to the show like Mr. Twisty's Twisted Cheese Curls (Cheetos), Mr. Nezzer's Chocolate Bunnies (Annie's Gluten Free Bunny Cookies), and Jonah's Fishy Friends (Goldfish). These are just a few of the many food possibilities to go with the Veggie theme... other options could include Donuts for Benny, Noah's Orange Arks (sliced oranges or orange slice candies) or Stop, Break a Fortune Cookie! You don't have to make it over the top complicated to get great Veggie Themed treats! Of course, no birthday party is complete without cake! 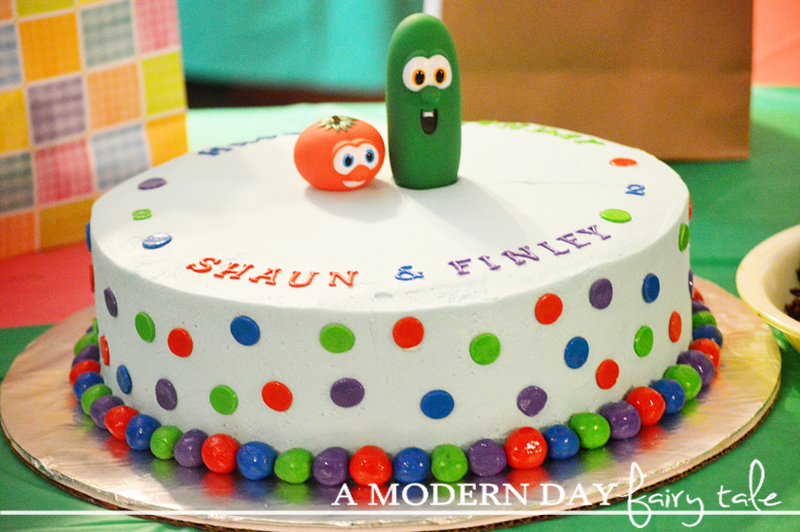 We had a friend and fellow scout mom help us with a simple cake design, using some Veggie bath toys as a topper! When it came to deciding on party games, I had several different ideas- such as a 'Pin the Plunger on LarryBoy'. However, for us personally my son doesn't do well with transitions and I knew from past experiences that typical party games might cause some trouble. Still, no party can be a party without games! So instead I purchased some Veggie Tales board games, puzzles and coloring books for the kids to enjoy as they pleased. We brought out our bounce house and played a variety of Veggie CDs throughout the party! But my absolute favorite was our scavenger hunt! This fun game was called 'Oh Where Is My Hairbrush?' 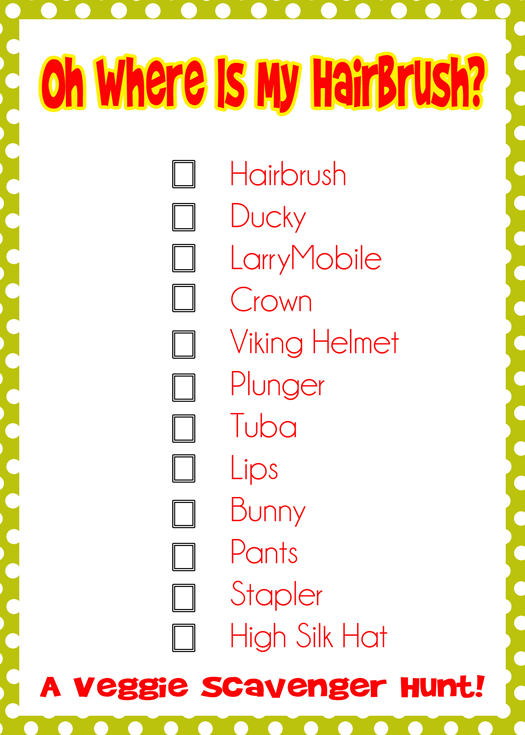 and featured random items related to Veggie Tales- like a plunger, crown, bunny, lips, pants, etc. We had these items hidden throughout the decor and allowed our guests to search for them at their convenience as they enjoyed the rest of the party. At the end, they could turn in their checklist for their goody bag (though everyone received a goody bag, regardless!) It was a lot of fun to create, and to watch the kids enjoy too! Most importantly, it was still fun, without being overwhelming for my son! You can download and enjoy with this free printable too! Goody Bags are such a fun way to tell your guests thank you for coming, so I always love putting together small surprises for the kids to enjoy! I filled these bags with a little bit of candy, some party bubbles and random novelty prizes and finished them off with super fun Veggie Tales mini felt posters I stumbled on in Family's Christian's clearance section! But the most fun about them was the bags themselves! 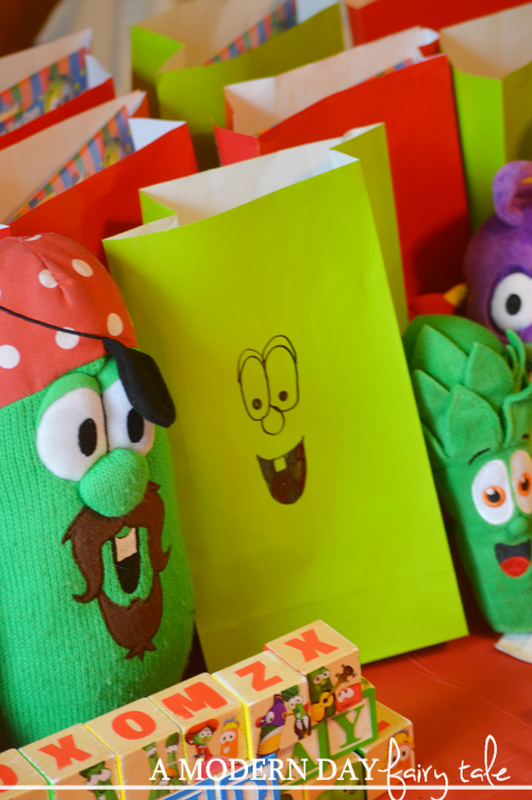 Again, finding Veggie Tales party supplies at your local party store is unlikely so I made my own! I used plain red and green treat bags and drew Bob or Larry's face on them. I'm no artist, but these faces are simple enough even for me! They were easy and inexpensive and the kids loved them. Of course, no Very Veggie Birthday would be complete without the perfect gift...and there are certainly MANY great options to choose from- toys, books, DVDs, music...you cannot go wrong! My kids received/ will receive a little bit from every category! To make it easy, I've created this fun shopping guide with just a few of my favorites! You can find all of the great Veggie Tales products above...and MANY more at Family Christian! Stay connected and follow along at the links below for ALL your Veggie Tales needs! 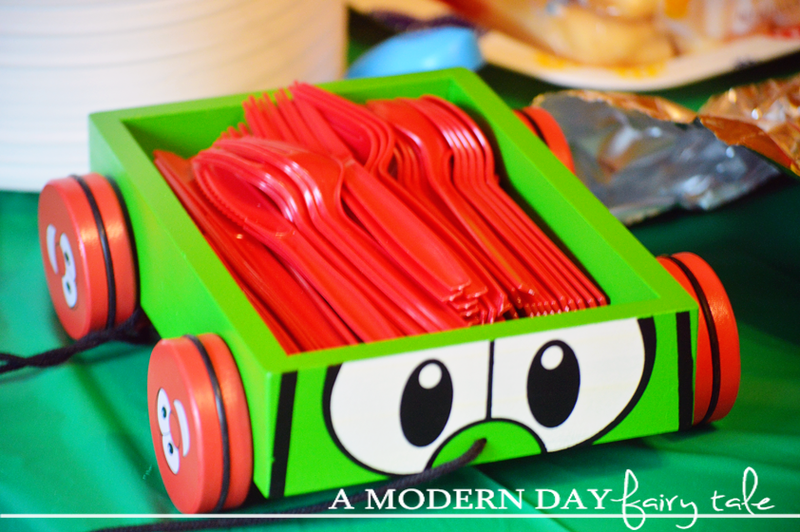 Are you planning a Veggie Tales Birthday Party? What other fun ideas do you have to create the ultimate Veggie party? I love the food ideas you have, so creative! I guess there are a lot of great songs you can use to inspire a party like this. I'll have to keep all these ideas in mind for the future! I think you did a good job, especially the creativity with the lunch bags. The cake was beautiful. What a fun party! I especially love that scavenger hunt! I love the scavenger hunt idea! I like the Dollar store for any kind of a party. Adorable! I loved Veggie Tales as a kid, this is such a neat party! A person who is a bad communicator could easily party rentals in san diego misunderstand you and not give the correct directions.